For years I thought Timbuktu was a made-up name for “the ends of the earth.” When I found out it is a real place, I developed a fascination for it. During a fact-finding trip to West Africa for my job in 1986 this fascination became an irresistible urge. Timbuktu wasn’t on my itinerary, but I was going anyway. I hitched a ride from Bamako, Mali, 500 miles away, on a small plane chartered by UNICEF. Two doctors were in Timbuktu and might fly back on the return flight. That meant I could be bumped, but I decided to take the chance. When we landed, I stood by the plane on the windswept outskirts of the famous Berber outpost. There was not a spot of true green anywhere in the Saharan landscape. Dust blotted out the sun. I squinted in the 110 degree heat, trying to make out the mud-walled buildings of Timbuktu. The open-air marketplace in the center of town was crowded. The men and women wore flowing robes and turbans as protection against the sun. The men were well armed with swords and knives. I felt their suspicious eyes. I went from person to person trying to find someone who spoke English. I finally came across a local policeman who understood my broken French. My presence was causing a sensation in the marketplace. I was surrounded by at least a dozen small children jumping and dancing, begging for coins and souvenirs. The situation was extreme. What was I to do? I wanted to talk to my father. He had known what it was like to be a foreigner in a strange land. But my father, Nate Saint, was dead. He was one of five missionary men killed by the Auca Indians in the jungles of Ecuador in 1956. I was only four then, and my memories of him were like movie clips; a lanky, intense man with a serious goal and a quick wit. He flew missionaries and medical personnel in his Piper airplane. Even after his death my father was a presence in my life. I’d wanted to talk with him before, especially since becoming a father myself. But in recent weeks this need had become urgent. For one thing, I was new to relief work. For the first time in my life, I was surrounded by people who were hostile to the Christian faith. It was a parallel to the situation Dad had faced in Ecuador. Just like my dad, I said, “My God is real; He lives inside me.” Yet the question lingered in my mind: Did my father have to die? I couldn’t help but think the murders in Ecuador were an accident of bad timing. The missionaries had landed just as a small band of Auca men were in a bad mood for reasons that had nothing to do with faith or Americans. Now I felt threatened because of who I was and what I believed. If I could not make arrangements by nightfall, what would happen? This was truly that last outpost in the world. Several westerners had disappeared in the desert without a trace. I asked the children, “Where is l’Eglise Evangelique Christienne?” The youngsters were willing to show me the way, though several elderly men and women scolded them harshly as we passed. Then the children pointed out a young man who was approaching us in the dirt alley. There was something inexplicably different about the handsome young man with dark skin and flowing robes. His name was Nouh Ag Infa Yatara. Nouh signaled he knew someone who could translate for us in an American mission compound on the edge of town, so we went. I asked Nouh, “How did you come to have faith?” The missionary began to translate. “You learned them?” I asked. When Nouh’s parents found that he had portions of such a despised book defiling their house, they threw him out and forbade anyone to take him in. He was not allowed back in school. But something had happened. Nouh had come to believe that what the Bible said was true. Nouh’s mother was desperate. The family’s character was in jeopardy. Finally she decided to kill her son. She obtained poison from a sorcerer. Nouh was invited to a special family feast where his mother poisoned him. Nouh ate the food and wasn’t affected. But his brother, who stole a morsel of meat from the deadly dish, became violently ill and remains partially paralyzed. Seeing God’s intervention, the family and the townspeople were afraid to make further attempts on his life. But he was condemned as an outcast. Our missionary translator remembered the story too. “As a matter of fact, one of those men had your last name,” he said to me. The missionary and Nouh and I talked through the afternoon. When they accompanied me back to airfield that night, we found that the doctors weren’t able to leave Timbuktu after all. There was room for me on the UNICEF plane! As we hugged each other, I realized Nouh and I had gifts for each other that no one else could give. I gave him the assurance that the story that had given him courage was true. He, in turn, gave the assurance that God had used Dad’s death for good. 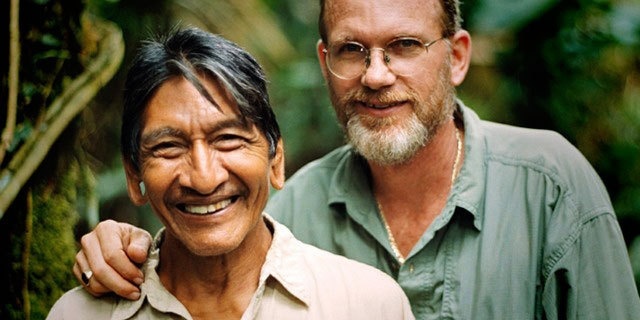 Steve Saint, with Mincaye, one of the Auca who killed the five missionaries in 1956. Heavenly Father, we pray for Nouh and those like him, whose hope is in you, and who serve you amidst much danger and difficulty. Bless their work and send your Holy Spirit to open the hearts of those to whom they preach, so that they too may know the Savior, Jesus Christ. Amen. This entry was tagged missions, Stories. Bookmark the permalink.